1 Department of Molecular Cell Biology, Samsung Medical Center, Sungkyunkwan University School of Medicine, Suwon 16419, Republic of Korea. 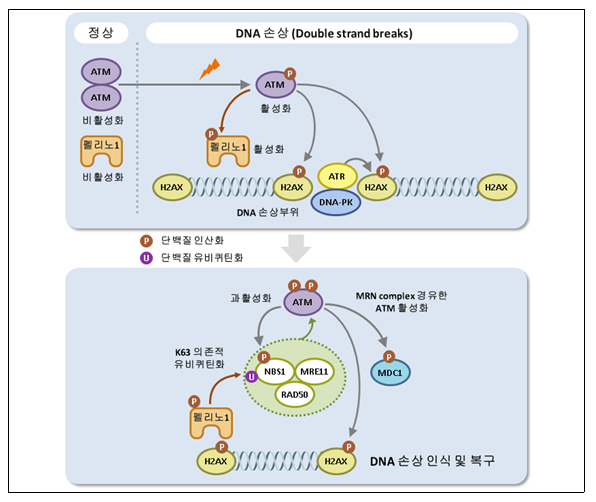 2 Genomic Instability Research Center, Ajou University School of Medicine, Suwon 16499, Republic of Korea. 3 Institute of Medical Science, Ajou University School of Medicine, Suwon 16499, Republic of Korea. 4 Department of Health Sciences and Technology, SAIHST, Sungkyunkwan University, Seoul 06351, Republic of Korea. 5 Department of Biochemistry and Molecular Biology, Ajou University School of Medicine, Suwon 16499, Republic of Korea. 6 Department of Biological Science, Dong-A University, Pusan 49201, Republic of Korea. 7 Graduate School of Cancer Science and Policy, Research Institute, National Cancer Center, Goyang 10408, Republic of Korea. These authors contributed equally: Geun-Hyoung Ha and Jae-Hoon Ji. *Correspondence and requests for materials should be addressed to H.C. or to C.-W.L. or to J.H.J. DNA double-strand break (DSB) signaling and repair are critical for genome integrity. They rely on highly coordinated processes including posttranslational modifications of proteins. Here we show that Pellino1 (Peli1) is a DSB-responsive ubiquitin ligase required for the accumulation of DNA damage response proteins and efficient homologous recombination (HR) repair. Peli1 is activated by ATM-mediated phosphorylation. It is recruited to DSB sites in ATM- and γH2AX-dependent manners. Interaction of Peli1 with phosphorylated histone H2AX enables it to bind to and mediate the formation of K63-linked ubiquitination of NBS1, which subsequently results in feedback activation of ATM and promotes HR repair. Collectively, these results provide a DSB-responsive factor underlying the connection between ATM kinase and DSB-induced ubiquitination.